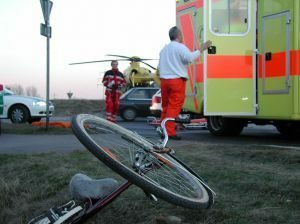 A bicycle accident is different from normal vehicle accidents. The biggest problem is that bike riders don’t have proper protections against the car drivers. This can result in serious injuries or even death when the cyclist is involved in an accident. While bicycle accidents may be dangerous, West Palm Beach, FL car accident rules apply to bike accident claims just as it applies to people involved in a vehicle crash. This signifies that the cyclist is entitled to some compensation and benefits from the negligent driver that caused the accident. The cyclist is responsible for pursuing this compensation most of the time. Trying to claim some compensation for a bicycle accident victim can be so stressful. Fortunately, a West Palm Beach bicycle accident lawyer can help you protect your legal rights, and claim the compensation from the person that caused you harm. The law allows the cyclist to share the road with conventional vehicles. But the following are the various drivers’ negligence that can result in accident. Not stopping for the pedestrian, and traffic lights. Also, such accidents can be caused by faulty brakes, expired tires, and an uncertified helmet. Even if you are not sure your bicycle is in the right condition, you should do the due diligence to check before using it. Bike riders who are seriously injured can take some legal action to claim the monetary compensation due to them from the driver that caused the accident. In case the bicycle rider suffers a wrongful death, the family of the deceased victim involved in the crash has the right to pursue the compensation due to the victim. When such bike accident gets to the court, the victim or the family of the deceased victim involved in the accident will need to show the severity of the injury and claims that the driver is to be blamed for such accidents. When such cases get to the Court, it’s left to the judge or the jury to check if those claims are true. If found to be true, riders are awarded monetary damages. Most of the time bicycle accidents don’t usually get to the jury. Instead, such cases are settled outside the court where the West Palm Beach bicycle accident lawyers have a negotiation or settlement with the insurance company. A settlement is a payment you receive, not to sue the cause of the crash. All of these compensations should help you pay for the bill and take care of the various pain caused by accident. What should you do if involved in Bicycle Accident? If you are involved in a bicycle accident, you should try as much as possible to document the details of the scene as soon as possible. You can take the pictures of the scenes and the plate number of the car that hit you if you have your phone with you and the insurance information of the vehicle. You can also capture the bicycle that was involved in the accident as a form of evidence to get the required compensations. It is a good thing to notify the police to come and check the point of the accident before the victim involved is rushed to the hospital in case of injuries. Are you involved in an accident or someone you love which may be suffering from financial and emotional challenges? We know what you are going through, and will be glad to help you. We will love to help you recover all your compensation and benefits you may struggle to get.